Hear original music & audio from the world's largest community of musicians, bands, producers and audio creators of all types. SoundCloud is the world’s leading audio platform, with over twelve hours of music & audio posted every minute. Find and play new songs, remixes, comedy, news and more. 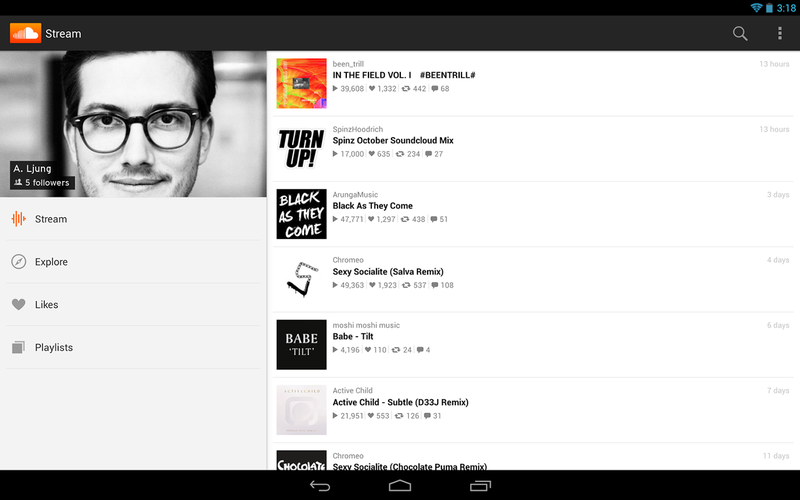 With the SoundCloud app for Android, you can hear anything, wherever you are. ✓ New Explore: browse trending tracks by genre or check out the 'Trending Music' and 'Trending Audio' feeds. ✓ Google+ Sign-in and share! SoundCloud brings you the best original new music & audio direct from the creators themselves. Find and follow your favourite bands, singers, producers and audio creators of all kinds, so that their latest tracks, sets and recordings appear in your stream. Sharing your favourite music and audio to social networks is simple and fast: post tracks to Facebook, Twitter, Google+ and Tumblr so your friends can hear them too. Get started with SoundCloud: it's easier and simpler than ever to discover and share music & audio you love.